Republican presidential nominee Donald Trump has hired pro-life pollster and political strategist Kellyanne Conway (pictured right) as his new campaign manager. “I want to win,” Trump said of the decision on Tuesday. 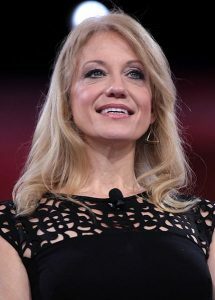 “That’s why I’m bringing on fantastic people who know how to win and love to win.” During the GOP primary, Conway worked to nominate Trump’s closest opponent, pro-life Sen. Ted Cruz. “I have known and trusted Kellyanne Conway my entire professional life,” Susan B. Anthony List President Marjorie Dannenfelser said in reaction to the hire. “No one is better at understanding what real people are thinking and how to connect with them than Kellyanne.” Dannenfelser expects her to be a major asset in “expos[ing] Hillary Clinton’s extremism in this general election.” Clinton is 100% pro-abortion and a longtime ally of Planned Parenthood. This is the second major hire Trump, a former pro-choicer, has made to appeal to pro-lifers. In May, he brought on respected pro-life expert John Marshburn as his Policy Director.